I want this to be a Christmas card. This NEEDS to be a Christmas card. Nice sANTa! Many researchers Photoshop the old Santa hat onto their study animals at this time of year, but none as skillfully as you. Nice! I’d even say, brilliant! May your holidays be fantastick and not at all louse-y! Fantastic photo Alex! I agree … it needs to be a Christmas Card! Merry Christmas to you and your wife. May your New Year be Happy, Healthy, and filled with many any projects! Perfect holiday card, Santa should use these instead of those damn elves. Great job, you are very talented. Merry Christmas and great blogging. Definitely needs to be a Christmas card! No Beard! 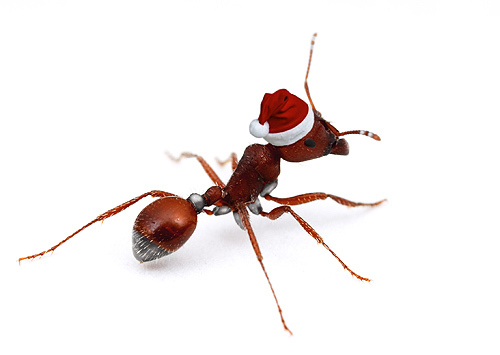 What kind of Pogonomyrmex santa is that!? I agree with MrILTA — Needs an exaggerated white psammophore! Maybe I’m wrong and it’s Messor clause. that explains why my presents were so TINY this year! on January 1, 2010 at 6:31 pm JasonC. on January 4, 2010 at 4:43 pm Ho! Ho! Ho!